Alexis Tsipras had allegedly a phone talk with the ANEL party leader while discussing a possible coalition and future of the country. 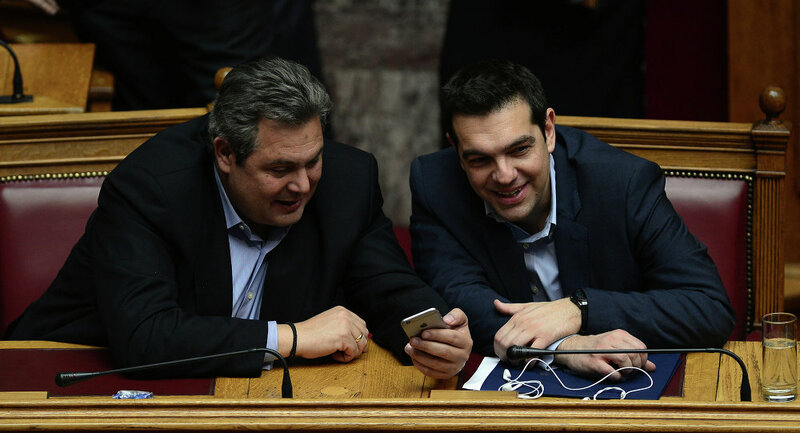 ATHENS (Sputnik) — Head of the Syriza party, leading in the Greek snap elections, Alexis Tsipras, discussed a possible coalition with Panos Kammenos, the conservative Independent Greeks (ANEL) party president in a phone conversation, the Athens News Agency reported. The previous Syriza government created a coalition with ANEL after the January snap elections. The scenario could repeat, if ANEL passes the 3-percent threshold in the elections. The Independent Greeks (ANEL) Party leader Panos Kammenos confirmed on Sunday that he will be cooperating with Syriza party on forming a coalition government, Mega television channel reported. "We continue our negotiations on forming a coalition government," Kammenos said, according to the media. "From tomorrow morning we will work with Alexis Tsipras [Syriza leader] on the exit from the impasse in which our country is," the politician said. After 50 percent of the votes counted, Syriza party leads the Greek parliamentary elections with over 35 percent of votes in support.